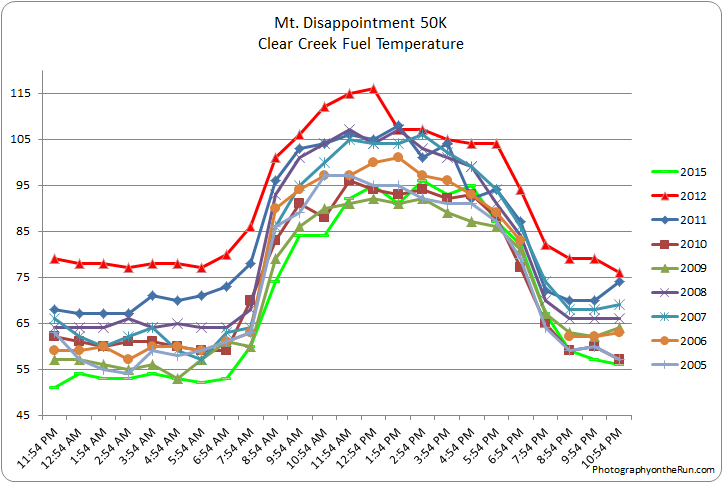 Photography on the Run: The fuel temperature at Clear Creek for the Mt. Disappointment 50Ks from 2005-2015. The fuel temperature is temperature of a ponderosa pine dowel in direct sunlight. It better approximates the temperature a runner experiences in direct sun, especially on exposed, south-facing slopes. The fuel temperature at Clear Creek for the Mt. Disappointment 50Ks from 2005-2015. The fuel temperature is temperature of a ponderosa pine dowel in direct sunlight. It better approximates the temperature a runner experiences in direct sun, especially on exposed, south-facing slopes.